I raced sailboats for about 20 years. 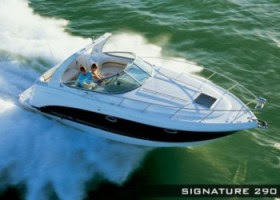 I just switched to a Chaparral Signature 290, which has no name. My sailboat names were Asylum (Choat 37) and Expresso (Express 37), but Asylum is still being used. 3 partners all brothers... we don't want the 3 in the name. We all grew up in Puget Sound, Seattle. One of my brothers is now in New Mexico until he retires in a couple years...Intel. 2 are programmers, one builds chips...vp intel. It is a fast cruiser, and we have another fishing boat (Chromatoas)(Chrome stealheads), so I want to stay away from fish names. P.S. Some wives may need to agree to it. Good advice on boat names. No more fish names is always a good thing. If you don't want 3 in the name how about 3 in a different language. You didn't mention where you plan on doing your boating, but if you are still in Puget Sound, how about "Sound Machine"?